Army and police officers block the road ahead of a protest by Crimean Tatars (visible in the background) at a Russia-Ukraine border checkpoint outside the town of Armyansk, Crimea on May 3, 2014. Human rights protections in Crimea have been severely curtailed since Russia began its occupation of the peninsula in February 2014. In the past eight months, the de facto authorities in Crimea have limited free expression, restricted peaceful assembly, and intimidated and harassed those who have opposed Russia’s actions in Crimea. In particular the authorities have targeted the Crimean Tatar community, a Muslim ethnic minority that is native to the Crimean peninsula and that has openly opposed Russia’s occupation. At the same time the authorities have failed to rein in or effectively investigate abuses by paramilitary groups implicated in enforced disappearances and unlawful detention and ill-treatment of Crimean Tatars, activists, journalists, and other individuals who are or perceived to be pro-Ukrainian. By bestowing Russian citizenship on Crimea residents through a coercive process, the authorities have also engaged in discrimination against Ukrainian citizens in Crimea, laid the groundwork for the potential expulsion of some Ukrainian citizens, and violated their obligations as an occupying power under international humanitarian law in relation to protecting civilians’ rights. Following the signing of the Treaty on the Adoption of the Republic of Crimea into Russia between local Crimea authorities and Russia and the Russian Duma passing the law On the Acceptance of the Republic of Crimea into the Russian Federation and the Creation of New Federal Subjects on March 20, 2014, Russian and Crimea’s authorities started the process of extending Russian legislation and policy to Crimea. This includes Russian laws relating to citizenship, media registration, and laws on “extremism,” including prohibited literature. In particular, authorities in Crimea have used Russia’s vaguely worded and overly broad anti-extremism legislation to issue several “anti-extremist warnings” to the Mejlis, the Crimean Tatar representative body, and have banned mass public gatherings by the Crimean Tatar community. Between August and October, authorities conducted invasive and in some cases unwarranted searches at mosques and Islamic schools and searched dozens of private homes of Crimean Tatars, including members of the Mejlis. The searches, which the authorities say were conducted to look for “drugs, weapons, and prohibited literature,” were carried out by both local police and Russia’s Federal Security Service (FSB) but also involved dozens of unidentified armed, masked men. The authorities have harassed pro-Ukraine and Crimean Tatar media outlets, searched their offices, shut down some, and threatened others with closure. The FSB and Crimea prosecutor’s office issued formal and informal warnings to leading Crimean Tatar media outlets against publishing “extremist materials” and invited editors to their offices for meetings during which they threatened that the outlets would not be allowed to re-register under Russian legislation unless they changed what they called their anti-Russian editorial policies. This report documents the abuses outlined above. It is based on on-site research in Crimea in October 2014, during which a Human Rights Watch researcher met and spoke with journalists, activists, lawyers, civil society representatives, and members of the Crimean Tatar community, including the leadership of the Mejlis and the Spiritual Directorate of the Muslims of Crimea. Human Rights Watch researchers also conducted telephone interviews with people who have left Crimea for mainland Ukraine. The report also includes previously published material gathered during a research trip to Crimea in March 2014. On November 6, Human Rights Watch sent a letter summarizing our research findings to the Crimean authorities. We have not yet received a response. Human Rights Watch considers that as a matter of international law Russia has been an occupying power in Crimea since at least late February 2014 and assesses its actions with respect to the law on occupation under international humanitarian law. Russia is an occupying power as it exercises effective control in Crimea without the consent of the government of Ukraine, and there has been no legally recognized transfer of sovereignty to Russia. The referendum held by the local authorities, without the authorization of the Ukrainian government or any broad-based endorsement by the international community, and Russia’s unilateral actions following the referendum cannot be considered to meet the criteria under international law for a transfer of sovereignty that would end the state of belligerent occupation. International human rights law also remains applicable to Crimea, including all treaties ratified by Russia, such as the European Convention on Human Rights and the International Covenant on Civil and Political Rights. Under the law of occupation, Russia has an obligation to restore and ensure public order and safety as far as possible while respecting, unless absolutely prevented from doing so, Crimea’s and Ukraine’s laws in force prior to March 2014. Russia is also responsible for violations of international humanitarian and human rights law committed by local authorities or proxy forces and has a duty to prevent and prosecute such violations. Russia cites the local Crimean authorities’ request to be part of Russia, later approved by the Russian parliament, to maintain that it is not an occupying power, even though the local authorities had no authority to make that request, that Crimea requested to be part of Russia, and that this request was approved by the Russian parliament. It therefore acts as though Crimea were a part of Russia and extends Russian federal laws to Crimea notwithstanding the presumption imposed on occupying powers that they will respect, unless absolutely prevented from doing so, the occupied country’s laws in force. 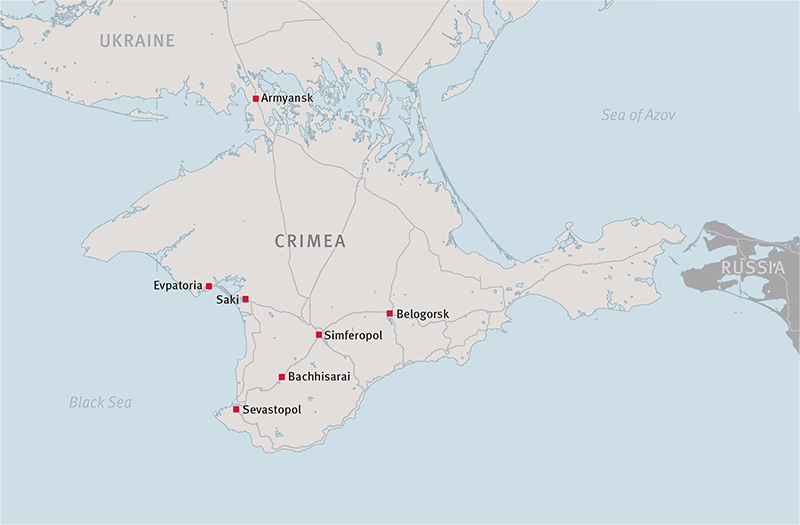 In this report Human Rights Watch uses the term “authorities” to refer to those in Crimea who de facto exercise effective control on the peninsula and are de facto responsible for the governance and administration of Crimea, irrespective of the legal status of those agents under Ukrainian or Russian law. Human Rights Watch, in accordance with its longstanding policy on laws of armed conflict, remains neutral on the decisions of parties to a conflict to use military force or to militarily occupy of another country or region. However, we seek to ensure that international law governing the conduct of war and occupation are respected. Ensure prompt, effective and impartial investigations into all allegations of human rights abuses by the police and other auxiliary forces that have been operating in the region since February 2014. Disband all self-defense units; the regular police force should not incorporate into its ranks members of self-defense units who have been implicated in human rights abuses. Cease all actions that target members of the Crimean Tatar community under the pretext of combating extremism. Cease all unjustified interference with media freedoms and ensure that media can convey a plurality of views, even if they do not support Russia’s actions in Crimea; immediately cease and condemn all physical attacks and intimidation against journalists. Ensure access to Crimea for human rights monitoring by independent groups and humanitarian and intergovernmental organizations without imposing undue restrictions based on point of entry. Reverse the process whereby Ukrainian citizens were required to choose between Russian and Ukrainian citizenship; ensure that no Ukrainian citizen is pressured, directly or indirectly, into accepting Russian citizenship and that there are no adverse, including discriminatory, consequences for those who retain Ukrainian citizenship. Ensure that all people can make fully informed choices about citizenship by ensuring availability of clear and accurate information regarding the requirements of Russian citizenship and regarding the consequences of choice of citizenship. Take no action that would deprive Crimea residents who retain Ukrainian citizenship of rights they enjoyed prior to March 2014. Press members of the UN Security Council to adopt a Chapter VI resolution urging for the full implementation of the recommendations regarding the situation in Crimea contained in the reports on Ukraine by the UN Human Rights Monitoring Mission in Ukraine. The OSCE’s Special Monitoring Mission, whose mandate coversall of Ukraine, should, without further delay, be granted access to establish a permanent presence in Crimea to operate and report freely. Urge the Swiss OSCE chairman-in-office to organize a public discussion on Crimea during the December 4-5, 2014 OSCE Ministerial Council. OSCE participating states should urgently consider organizing informal and open Permanent Council briefings on Crimea, inviting representatives from civil society and other international organizations to report on developments and discuss international responses. Press for immediate and unfettered access to Crimea for other relevant human rights mechanisms of the OSCE, the UN, and the Council of Europe. Raise concerns about the human rights violations documented in this report, as well as in regular reports by the UN Human Rights Monitoring Mission in Ukraine and the October 2014 report by the Council of Europe commissioner for human rights, and urge the de facto authorities of Crimea and the Russian Federation to promptly implement the recommendations addressed to them. Urge Ukraine to reconfirm its declaration under article 12(3) of the Rome Statue made on April 17, 2014 accepting jurisdiction for the International Criminal Court (ICC) over the territory of Ukraine but removing time constraints on the court’s jurisdiction, and move swiftly to ratify the Rome Statue including addressing any obstacles to such ratification. Reconfirm the declaration made under article 12(3) of the Rome Statue of the ICC on April 17, 2014 accepting the jurisdiction of the ICC with respect to alleged crimes committed on Ukrainian territory but removing the time constraints (for the period November 21, 2013 to February 22, 2014) on the court’s jurisdiction. Move swiftly to ratify the Rome Statue, including addressing any obstacles to such ratification. In 1944, Soviet authorities accused the entire Crimean Tatar population of Crimea of collaborating with the Nazis and, as collective punishment, deported all Crimean Tatars, then estimated to be about 240,000 people, to distant regions of the Soviet Union. More than half reportedly died in the months following deportation from starvation and disease. Although Crimean Tatars were allowed to return to Crimea in the mid-1980s, the authorities did not take meaningful steps to facilitate their return or compensate them for lost property. In April 2014, the Ukrainian parliament recognized Crimean Tatars as an indigenous group of Ukraine. Also in April, Russian President Vladimir Putin signed a decree on political, cultural, and economic rehabilitation of Crimean Tatars. According to the last Ukrainian population census data, in 2001 Crimean Tatars comprised about 12 percent of the population of Crimea. For example, Human Rights Watch reported on the case of two Crimean Tatar cousins, Islyam Dzhepparov and Dzhevdet Islyamov, who disappeared on September 27 after being seen bundled into a minivan by two men in black uniforms. At time of writing, the criminal investigation into their disappearances has not led to results. During the last week of May, Leonid Korzh, Timur Shaimardanov, and Seiran Zinedinov, activists with a pro-Ukraine group, disappeared within several days of each other. Two of them, according to their families, had hostile encounters with the “self-defense” units in March. Their relatives and lawyers said their whereabouts remain unknown, and there has been no progress in investigations into the circumstances of their disappearances. Edem Asanov, a Crimean Tatar who was not politically active but had occasionally discussed on his social network VKontakte page issues related to the situation of Crimean Tatars, disappeared on September 29 in Evpatoria, a resort town approximately 60 km from Simferopol, on his way to work. Six days later, police found Asanov’s body hanged in an abandoned building in Evpatoria. The circumstances surrounding his death remain unclear. Eskender Apselyamov, 23, disappeared on October 3. Relatives told Human Rights Watch that Apselyamov left his apartment to go to work but never arrived. His relatives’ attempts to locate him were unsuccessful. The police have started an investigation. In March Human Rights Watch documented a case of a disappearance and subsequent killing of a Crimean Tatar activist, Reshat Ametov. Ametov’s case is described in more detail below. The Mejlis, a self-governing body comprised of 33 members, is the highest executive body of the Crimean Tatar people and represents them in their dealings with the authorities and international bodies. The Mejlis has openly criticized Russia’s occupation of Crimea, called on Crimean Tatars to boycott the March referendum on Crimea’s status and the September local elections, and also called on the authorities to disarm and disband the self-defense units in Crimea. On April 22, 2014, the authorities banned Mustafa Dzhemilev, the informal leader of the Crimean Tatars and a previous chair of the Mejlis, from entering Crimea for five years after Russia’s Federal Migration Service (FMS) declared him a persona non grata in Russia. On May 3, when Dzhemilev, a Ukrainian citizen, attempted to enter Crimea from mainland Ukraine through the Armyansk checkpoint in northern Crimea, law enforcement and members of self-defense units refused to allow him to enter. On May 14, the authorities searched Dzhemilev’s house in his absence. Dzhemilev has not been charged with any offense. On May 3, 2014, about 2,000 Crimean Tatars came to greet Dzhemilev at the border. According to media reports, some of those gathered at the Armyansk checkpoint broke through a police cordon while attempting to create a corridor through which Dzhemilev could cross through the checkpoint buffered from law enforcement and border officials. Law enforcement stopped the crowd, which at times, according to one eyewitness, became agitated but according to other witnesses, stood down upon Dzhemilev’s request. On the same day, groups of Crimean Tatars protested Dzhemilev’s ban in several cities in Crimea. While the protests were largely peaceful, in some cases they blocked roads, disrupting traffic.Local authorities initiated administrative proceedings against dozens of Crimean Tatars in connection with the events of May 3, fining at least 140 of them for “public disorders” and “unlawful border crossing” for amounts ranging from 10,000 to 40, 000 rubles (approximately US$290 to $1,500). Human Rights Watch was not in a position to independently research the May 3 events and assess whether the administrative charges and fines were proportionate responses to the specific incidents. However, the authorities have subsequently referenced these events to justify extensive searches, warnings, and other measures against Crimean Tatar groups and individuals. The authorities have not produced new, specific evidence to justify such measures. Rather, the measures appear from their scope and frequency and from the vague accusations levelled at those targeted designed to intimidate members of the Crimean Tatar community who are perceived as opponents of Russia’s takeover of Crimea, and therefore opponents of Russia. On May 4, the prosecutor of Crimea issued a warning to Refat Chubarov, the chair of the Mejlis, that the group was at risk of being accused of “extremist actions” for the May 3 events. Chubarov told Human Rights Watch that the prosecutor read the warning out to him and threatened to dissolve the Mejlis and ban its work should it engage again in such “extremist” activities as the May 3 actions but did not provide him with a copy of the warning. On July 5, authorities banned Chubarov, who at that time was away from Crimea, from entering the peninsula for five years. Also in May, two days before the 70th anniversary of the deportation of Crimean Tatars (on May 18, 1944), which the Mejlis for years had commemorated by organizing large peaceful gatherings, local authorities banned all mass events on the territory of Crimea through June 6, referring to possible “provocations” and disruption of the summer holiday season. Local authorities eventually allowed a small-scale commemoration event to take place on May 17, although not in the center of Simferopol. The prosecutor issued several statements warning the Mejlis against “extremist” activities, including after it called for a boycott of the September 14 local elections. In September, the de facto prime minister of Crimea stated publicly that the Mejlis was not a “legal organization” and that it had “very little authority” among the Crimean Tatar population. Russian authorities have repeatedly stopped and questioned Mejlis members and other Crimean Tartars when they traveled across the border to mainland Ukraine. For instance, between July and September they stopped Eskender Bariev, a Mejlis member, at least seven times. Since March, when Russia introduced a policy whereby all residents of Crimea had to choose between retaining their existing Ukrainian citizenship or accepting Russian citizenship, Bariev had organized several seminars for Crimean Tatars to explain what was at stake in one’s choice of citizenship and taking a Russian passport. On July 23, eight Russian border guards armed with automatic weapons surrounded Bariev’s car at the Armyansk checkpoint when he and a colleague were returning to Crimea. Bariev told Human Rights Watch that after searching his car and looking through his possessions, the border guards took away his passport, camera, and audio recorder and questioned him about his religious beliefs and his Mejlis activities. Three hours later, they returned Bariev’s passport and equipment and let him through. Two weeks later, border guards again stopped Bariev as he was leaving Crimea with his family, questioned him, and held him for three hours. Three days later, as Bariev was returning to Crimea, the same border guards again detained him and took his passport. They brought him to their office for a meeting, during which they asked him whether he knew Mustafa Dzhemilev and why Crimean Tatars were distrustful of Russia. Bariev told Human Rights Watch that he has been stopped, searched, and questioned four more times in a similar manner since then. Bariev also said that Russian security services in Crimea invited him several other times for informal conversations. During one such conversation in May, a Federal Security Service (FSB) agent asked Bariev why he had not yet applied for a Russian passport. He also warned Bariev against what the agent called “extremist acts” during a planned public gathering commemorating the 70th anniversary of the deportation of Crimean Tatars. In October, authorities arrested and charged three Crimean men whom they accuse of carrying out various criminal acts during the protests on May 3. On October 22, police arrested Crimean Tatar activist Tair Smerdlyaev, a member of the Mejlis. Smerdlyaev’s brother, Zair, told Human Rights Watch that the law enforcement agents who arrested his brother told him that he was suspected of using violence against a police officer during the mass gathering on May 3. Smerdlyaev was placed in a temporary detention cell and on October 24 a court in Simferopol remanded him to pretrial detention pending a court hearing on the criminal charges against him scheduled for December 22. Smerdlyaev’s lawyer, Emil Kurbedinov, told Human Rights Watch that the October 24 court hearing was closed for relatives and the media and that during the hearing the judge rejected all of the defense’s motions and ruled to keep Smerdlyaev in custody despite insufficient evidence that would justify lengthy pretrial detention. Kurbedinov said that the judge based his decision to keep Smerdlyaev in custody on “oral accounts of 60 people, mostly Smerdlyaev’s neighbors,” who allegedly told police that Smerdlyaev had “extremist and anti-Russian views.” Despite Kurberdinov’s request, none of the witnesses for the defense were brought to court for the hearing. The judge also referenced information by the Interior Ministry’s Center for Combating Extremism alleging that Smerdlyaev “had extremist connections” and was a member of the Right Sector, an ultra-nationalist Ukrainian group. Zair Smerdlyaev told Human Rights Watch that authorities had arrested two other Crimean Tatar men, Musa Apkerimov and Rustam Abdurakhmanov, on October 16 and 17, respectively, on similar charges. A Simferopol court remanded both to pretrial custody pending investigations into criminal charges against them. Human Rights Watch is not aware of evidence—other than the alleged denunciations by neighbors and the allegations by the anti-extremism department—the authorities possess that they have used to justify keeping Smerdlyaev in custody prior to the trial. On September 16, police in Simferopol conducted a 17-hour search of the offices of the Mejlis, the Crimea Foundation, the charitable organization that administers the Mejlis, and the Mejlis newspaper Avdet. Riza Shevkiev, the general director of the Crimea Foundation and a Mejlis member, told Human Rights Watch that at 9 a.m. on September 16 the police and unidentified armed, masked men surrounded the building that houses all three offices, blocking the front door. The armed men warned journalists to stay away and threatened them when they tried to film, one of the journalists who was at the scene told Human Rights Watch. When Shevkiev arrived at the office shortly afterwards, law enforcement agents provided him with a copy of a court order requesting that a search be conducted at the Mejlis office “with the purpose of finding weapons, firearms and publications inciting racial, gender or religious discord.” According to Shevkiev, after searching the Mejlis offices and library, law enforcement agents searched the separate offices of the Crimea Foundation and Avdet. When Shevkiev requested a search warrant for those premises, law enforcement agents failed to provide one. The authorities confiscated all of the Mejlis’s equipment, including six computers, two hard drives, several flash drives, and documents, including notes from Mejlis meetings in recent months and several religious brochures. The police also broke into the safe in Mustafa Dzhemilev’s office and confiscated the money in it (approximately €3,670, US$200). The money was reportedly later returned to Dzhemilev’s wife at her request. The next morning several court bailiffs accompanied by a group of approximately 10 unidentified armed, masked men arrived at the Mejlis office and presented Shevkiev with a September decision by Simferopol’s Leninsky District Court stating that at the request of the Crimea prosecutor’s office the court had initiated administrative proceedings against the Mejlis’s charitable entity, the Crimea Foundation. The notification said that the prosecutor’s office alleged that Mustafa Dzhemilev was one of the group’s founders and that this violated Russian law regulating noncommercial organizations because he had been banned from Russia. The bailiffs also presented Shevkiev with a court order to freeze all of the Crimea Foundation’s assets, including seven properties and all bank accounts, pending a court hearing on excluding Dzhemilev from the foundation’s list of founders. The bailiffs told Shevkiev that he had 24 hours to vacate all premises owned or administered by the Crimea Foundation, which include the building that houses the foundation, the Mejlis, and Avdet. After that, the authorities sealed the Mejlis office and other property of the Foundation and froze all its bank accounts, effectively paralyzing the activities of the Mejlis and Avdet. Mustafa [Dzhemilev] was never among the list the founders of the Crimea Foundation. He is the president of the foundation, which is more of a ceremonial position. We have three founders, including me, and Dzhemilev’s name is not among us. But considering the absurdity of the situation, I assembled a conference of the board of the foundation and we agreed to “remove” Dzhemilev from the position that he never occupied in the first place. Shevkiev is currently appealing the court’s decision to seize the property of the Crimea Foundation. At time of writing, the offices of the Mejlis and Avdet remain sealed, and their bank accounts remain frozen. Since May, authorities have conducted a number of searches in the homes of Mejlis members and other Crimean Tatars. The searches intensified before significant public events. For example, on the night of May 14, a day before planned public gatherings to commemorate the 70th anniversary of the mass deportation of Crimean Tatars, the authorities searched dozens of homes, including the home of Mustafa Dzhemilev and the Mejlis’s press-secretary, Ali Khamzin. Khamzin said in a media interview that he was not at home during the search but that the authorities were reportedly looking for possible links to terrorism. Khamsin also said that several days earlier authorities summoned dozens of Muslims in Crimea to police stations where they took their fingerprints and asked questions about their religious beliefs. Searches became more frequent and intrusive in the lead-up to the September 14 local elections. According to the Crimean Field Mission, a rights-monitoring nongovernmental group on the ground in Crimea, in September alone authorities searched at least 15 homes of Crimean Tatars in Simferopol and surrounding areas, mostly homes of Mejlis members, as well as the home of a pro-Ukraine activist, and several mosques and Islamic schools. The searches were conducted by local police and Russian FSB personnel in the presence of dozens of masked, unidentified men armed with automatic weapons. In some cases, law enforcement agents who claimed to be looking for prohibited literature, weapons, and drugs refused to identify themselves, present documents authorizing the search, or allow independent witnesses to observe the search, as required by Russian law. In several cases documented by Human Rights Watch, law enforcement and security personnel detained the inhabitants for several hours, questioned them about their religious beliefs, or berated them for not obtaining Russian passports. Mejlis member Eskender Bariev told Human Rights Watch that on September 16 at about 6.30 a.m., a group of approximately 15 men— some 10 in camouflage uniforms and masks and the others in civilian clothing—came to his flat. One of the men introduced himself as a Crimea FSB lieutenant but refused to show identification. He showed Bariev a search warrant and said that they needed to search his apartment for weapons, drugs, and prohibited literature. Bariev requested that two outside witnesses be brought in to observe the search, as required by law, but the men told him that they brought their own witnesses. After searching his flat for two hours, the men left, taking Bariev’s laptop and a computer hard drive to conduct what they called “technical expert analysis.” At time of writing, Bariev twice inquired about his seized property but received no answer as to when it might be returned to him. The authorities have neither charged Bariev with any offence nor informed him if he is considered a suspect in an ongoing investigation. The search continued for over three hours. In the end, the security personnel confiscated five brochures, one of them of a religious nature, and left. About 20 minutes after the search ended, police took Asaba to the station, where they held him briefly for questioning before releasing him. Authorities also conducted intrusive searches in mosques and Islamic schools. In an interview with Human Rights Watch, Asadullah Bairov, the deputy mufti of the Spiritual Directorate of the Muslims of Crimea (Dukhovnoe Upravlenie Musulman Kryma, or DUMK) said that between June and September law enforcement agents conducted searches for prohibited literature in 8 out 10 religious schools in Crimea operating under the auspices of the DUMK. Bairov described a particularly intrusive search at a religious school in the village of Kolchugino in the Simferopol region, details of which he later learned from the director of the school. On June 24, 30 armed men, including police and FSB agents, forcibly entered the school and conducted an extensive search examining, among other things, the school’s library and students’ personal possessions. According to a DUMK press service statement, law enforcement broke the front door and several windows in the school. Bairov said that thirteen children and two teachers were on the school premises at the time. At the end of the search, which lasted about five hours, law enforcement officers confiscated several school computers and memory sticks. On the same day, authorities also searched the home of the school’s deputy director, held him at the police station for several hours for questioning, and released him. Bairov told Human Rights Watch that in September, authorities conducted more searches in several mosques and Islamic schools, looking for “extremist literature.” On September 17, authorities searched a mosque in Simferopol and on September 2, a mosque in Yalta. The deputy head of the DUMK told the media that the search in Yalta involved police, the FSB, and approximately 30 armed men. The search lasted seven hours and resulted in the authorities confiscating several religious books. According to the data gathered by the Crimean Field Mission, on September 9, police and the FSB searched a boarding school in the Bakhchisarai area, confiscating three religious books from the school library. Children were on the school premises at the time of the search. As reported by the Crimean Field Mission, some of the students’ parents said that police asked the children to remove all items with Crimean Tatar symbols on it. Asadullah Bairov told Human Rights Watch that between June and October, he and other DUMK members had several meetings with the de facto prime minister of Crimea, Sergei Aksyonov, during which they voiced concern about the searches, noting that religious schools, mosques, and the Muslim population in general were not given enough time to dispose of literature prohibited by Russian law. The Federal List of Extremist Materials was introduced by Federal Law No. 114-FZ “On Combating Extremist Activities” in July 2002. The list, which was first published in 2007 and has been updated regularly, currently includes about 2,500 publications, audio and video materials, and images. Alexander Verkhovsky, the director of the SOVA Center, a Russian nongovernmental organization (NGO) which conducts research on nationalism and racism and provides analysis on the government misuse of counter-extremism measures, told Human Rights Watch that approximately 1/3 of the banned items on the list are Islamic literature and that around 25 per cent of those items are widely used by the Islamic community, include no extremist content, and were banned inappropriately. Additionally, Verkhovsky noted that as published, the list is confusing, at times contradictory, and very difficult to comprehend, especially for a layperson. In Crimea the enforcement of this law has had a discriminatory impact on Crimea Tatars who are Muslims. In a meeting with the grand mufti of Crimea in September, which Asadullah Bairov also attended, Aksyonov acknowledged that law enforcement sometimes “went overboard” in conducting searches and promised to take steps to address the issues raised by the Spiritual Directorate, Bairov told Human Rights Watch. In a media statement in October, Aksyonov announced that Crimea residents will be given three additional months to dispose of all literature prohibited by Russian law. This does not address the underlying issue that the scope of Russian law and its enforcement in Crimea violates international law on the protection of freedom of expression, as well as the obligations of Russia as an occupying power. Also in September, the authorities searched the home of Elizaveta Bohutska, who is not a Crimean Tatar but is a well-known pro-Ukraine activist who is openly critical of Russia’s occupation of Crimea and the leader of a movement called Mothers of the World Against the War. In a telephone interview, Bohutska told Human Rights Watch that at around 5:30 a.m. on September 8, a group of men in civilian clothing, some of them armed and masked, came to her backyard in Simferopol and demanded that she come outside. One of the men fired five shots, one of them injuring Bohutska’s dog. One of them told Bohutska that he was from the Center for Combating Extremism and presented a warrant to search Bohutska’s home for weapons, ammunition, drugs, and prohibited literature. After the search, which lasted about three hours, the authorities seized three of Bohutska’s computers, including one belonging to her son, a camera, two flash drives, and some personal notes. They took Bohutska to the Center for Combatting Extremism in Simferopol and questioned her for seven hours without her lawyer present. The four officials who questioned Bohutska told her that the search was prompted by “complaints from her neighbors that she was inciting separatism by renouncing the ‘return of Crimea to Russia.’” According to Bohutska, the investigators mostly asked her about what they called her “anti-Russian” position and her Facebook posts in which she criticized Russia’s actions in Crimea. The same day, the authorities also searched another of Bohutska’s homes, which she rents out, and attempted to search her art gallery. After about seven hours of questioning, an investigator told Bohutska that she was a witness in a case connected with the May 3 events. Bohutska’s lawyer arrived at around 4 p.m. and said that Bohutska should stop answering questions in case they alleged she was incriminating herself. The interrogation ended, and Bohutska was allowed to leave at around 7 p.m. She left Crimea the same night and at time of writing has not returned. Crimea’s so-called self-defense units are armed paramilitary groups that emerged in late February to prevent any opposition to the March referendum on Crimea’s status. They have been involved in unlawful detention, abduction, ill-treatment including torture, and harassment of pro-Ukraine activists and other residents with complete impunity. Ukrainian human rights groups have reported that the units have also been involved in unlawful searches of persons and vehicles, violent dispersals of public gatherings, and attacks on journalists. Human Rights Watch has repeatedly called on the authorities to immediately disarm and disband those units operating outside any legal framework. In June, the parliament of Crimea attempted to bring the self-defense units under a legal framework by passing the law “On People’s Uprising,” which authorized self-defense units to, among other things, check identity documents and if necessary, assist police in temporarily detaining people. While the law clearly states that the self-defense units may act only in conjunction with police, as described below, they appear to be operating autonomously and regularly harass, question, and sometimes beat people without the presence of police. In one case Human Rights Watch documented in March, self-defense units appeared to be involved in the enforced disappearance and death of Reshat Ametov, a Crimean Tatar man who disappeared and was subsequently found dead in the Simferopol region in March. Ametov was last seen during a protest in the center of Simferopol on March 3, where three unidentified men in military-style clothing led him away. In October, Ametov’s family and his lawyer told Human Rights Watch that the investigation into the enforced disappearance and killing of Ametov has not provided any results. Human Rights Watch previously reported on several cases of abductions of pro-Ukraine activists by self-defense units, most of whom have been released. In some cases, the police were involved but appeared to have no coordination or control over these units. For example, in March armed groups abducted two well-known pro-Ukraine political activists, Andriy Shekun and Anatoly Kovalksy, held them for 11 days in secret detention with several other detainees, ill-treated them both, and badly tortured Shekun. After detaining the activists at a train station in Simferopol, members of a self-defense unit first took both activists to a police station where they were registered in police books. After that, armed men from a self-defense unit again took both activists to an unknown location where they remained for 11 days and were repeatedly questioned, beaten, and shot at with low velocity handguns commonly called traumatic weapons in the former Soviet region. Shekun was subjected to electric shock on two occasions. When Human Rights Watch spoke to Shekun in October, he said that he filed a complaint with the police in March but had not heard anything about the progress of the investigation since June. On June 2, members of a self-defense unit stopped a journalist, Sergey Mokrushin, and his colleague, Vladlen Melnikov, for publicly singing a song featuring profane lyrics about Russian President Vladimir Putin. Mokrushin told Human Rights Watch that at around 8 p.m., as he and Melnikov were returning from a party singing loudly, 10 armed men surrounded them on the street in the center of Simferopol. The men introduced themselves as members of Crimea’s self-defense units and said the two were being detained. Despite the journalists’ repeated requests to call the police, the men searched Mokrushin and Melnikov and then forced them to come to the self-defense headquarters nearby, where they handcuffed them, searched them once more, and questioned and beat them. Mokrushin told Human Rights Watch that after handcuffing both him and Melnikov, the armed men made them stand facing the wall, beat Mokrushin with batons on his ribcage and legs, and hit Melnikov’s head several times against the plexiglass wall. About an hour later, Melnikov managed to send a text message to his colleagues, who immediately started calling the authorities demanding that the men be released. The police arrived shortly after, questioned Melnikov and Mokrushin in the presence of the armed men who had assaulted them, and later released both without charge. Mokrushin had a bruised ribcage and several hematomas on his body. He reported the assault to the police the next day, and a week later, when he inquired about the progress of his case, police said they would contact him with any updates. At time of writing, four-and-a-half months later, Mokrushin has received no information on whether the police initiated a criminal investigation into the assault. Human Rights Watch is aware of several other cases in which police dismissed complains about abuses by self-defense units. For example, on the afternoon of May 6, self-defense units in the center of Simferopol attacked Adburaman Egiz, a 30-year-old Mejlis member. Egiz told Human Rights Watch that seven armed men wearing camouflage approached him as he was getting out of a car and demanded that he show his documents. Egiz refused, explaining that he did not know who the men were and asked that they call the police. The men said they would call the police but instead called in 20 more men in military-style clothing. They surrounded Egiz, handcuffed him, and started beating and kicking him. Egiz repeated loudly several times that he was prepared to show his passport, but they continued to hit him. After approximately three minutes, they stopped hitting him, checked his passport, and let him go. Self-defense units have also detained and in some cases beaten journalists and media workers as they were carrying out their work. For example, on May 18, self-defense units detained Crimean Tatar journalist Osman Pashayev, his cameraman, and seven other people, most of them media workers, while they were filming a mass gathering in Simferopol. Pashayev told the media that self-defense units forced him and his colleagues to stand facing a wall for several hours and interrogated and beat them before releasing them. The self-defense units also took away the journalists’ equipment, including three iPads, two iPhones, a laptop, and money amounting to 500 Ukrainian hryvnia (approximately US$100). The equipment and money were never returned to them. After his release, Pashayev left Crimea. The self-defense units publicly referred to ATR, the main Crimean Tatar channel, as “the enemy channel” and since March attacked and beat several ATR journalists who were filming public events and took away their equipment, the deputy director of the ATR channel told Human Rights Watch. In researching this report Human Rights Watch did not learn of any cases in which local authorities have effectively investigated unlawful actions by self-defense units. A draft law proposed by the de facto prime minister would grant amnesty to all members of self-defense units in Crimea for the period between February and April 2014, effectively ending any prospect for accountability for abuses during that period. In accordance with Russia’s position of applying its federal laws in Crimea, Russia has set a January 2015 deadline by which media outlets in Crimea must re-register under Russian law. A Human Rights Watch researcher met with several Crimean journalists and editors who spoke of pressure and censorship of media outlets and journalists critical of the authorities and of the impending deadline. This pressure appears to be part of the authorities’ efforts to stifle all pro-Ukraine media in Crimea. Many pro-Ukraine journalists have left Crimea for mainland Ukraine, and those journalists and media outlets who remain have found themselves unable to function freely. The authorities in Crimea have used Russia’s vaguely worded and overly broad anti-extremism legislation to pressure Crimean Tatar media outlets into ceasing criticism of Russia’s occupation of Crimea. For instance, the authorities issued official and informal warnings to Shevket Kaibullaev, the editor-in-chief of the Mejlis newspaper, Avdet, which was established in 1990 and publishes in Crimean Tatar and Russian. Kaibullaev told Human Rights Watch that in early June the Simferopol prosecutor’s office issued him an official warning that some of the newspaper’s materials allegedly contained extremist content, for example the call to boycott the September elections in Crimea and use of the terms “annexation,” “occupation,” and “temporary occupation” of Crimea. The authorities also called Kaibullaev for two informal conversations, he said, during which FSB agents and officials from the prosecutor’s office warned him that Avdet will not be allowed to re-register under Russian law if it continued to publish such controversial content. As noted above, on September 16, law enforcement agents searched the office of Avdet, located in the same building as Mejlis’s office in Simferopol. Kaibullaev told Human Rights Watch that the authorities did not show a warrant for the search of the newspaper’s office and did not let him inside until after the search ended. The authorities seized the newspaper’s stationary computer, a hard drive, and several flash drives. Kaibullaev said that because the authorities did not give him relevant procedural documents after they completed the search, he was not able to trace which of the law enforcement agencies conducted the search and seized the equipment. Avdet’s office has since remained sealed and its bank accounts frozen. Kaibullaev told Human Rights Watch that the day after the search, on September 17, the Crimean FSB office handed him an official warning that referenced Kaibullaev’s “personal responsibility” for publishing materials calling for the September election boycott with “intent to disrupt” the work of state bodies. The document explicitly warned Kaibullaev that such actions qualified as public calls for extremist activities, a crime punishable by up to five years in jail. Budzhurova said that after she responded that ATR was not inventing the coverage but showing news that really happened, the FSB agents threatened the television station with imminent closure and repeated that threat several times over the next few days. “They try to force us to not report on controversial subjects by threatening to shut us down,” Budzhurova told Human Rights Watch. Budzhorova also said that since March the authorities have on many occasions and mostly without explanation prevented ATR journalists from reporting on official events, such as local parliamentary sessions. In August, the authorities cancelled ATR journalist Shevket Namatullaev’s accreditation to cover local parliament sessions because he did not stand up during the Russian anthem, she said. A September 24 letter from the Interior Ministry’s Center for Combating Extremism to ATR’s director, which Human Rights Watch reviewed, stated that the center received information that ATR’s editorial policies were directed at creating “anti-Russian” public opinion and inciting “distrust towards authorities among the Crimean Tatar population.” The letter further requested that ATR provide the center with copies of its registration documents, documents authorizing ATR’s work, and all administrative documents, including the office rental agreement. “The atmosphere towards media in Crimea is so hostile that it made it practically impossible for us to continue working,” Budzjurova told Human Rights Watch. All those who obtained Russian citizenship are also subject to Russia’s military service requirements. Article 5 of the March 21 Russian law on the acceptance of Crimea into Russia states that residents of Crimea conscripted into the Russian armed forces will serve on the territory of Crimea until the end of 2016. Russia has not simply offered Russian citizenship to residents of Crimea, but rather Russia has compelled residents to choose between Ukrainian and Russian citizenship while imposing adverse consequences, directly and indirectly, on those who chose to retain Ukrainian citizenship. In addition, as documented below, there were serious flaws in the process for Ukrainian citizens who sought to retain Ukrainian citizenship: some Ukrainian citizens were unable to exercise their choice to retain citizenship and had Russian citizenship imposed on them. Others were subject to harassment and intimidation for not obtaining Russian citizenship. In such circumstances, the imposition of Russian citizenship in Crimea was coercive. Another impact of the change of citizenship is that men of conscription age who acquired Russian citizenship, whether through choice or default, will be subject to Russian mandatory military service requirements. Article 5 of the March 21 Russian law on the acceptance of Crimea into Russia states that residents of Crimea conscripted into the Russian armed forces will serve on the territory of Crimea until the end of 2016. This raises serious issues under international law discussed below. Under the Fourth Geneva Convention, civilians and other protected persons “may in no circumstances renounce in part or in entirety the rights secured to them by the present Convention …” and in particular an occupying power may not compel residents of the occupied territory to serve in its armed or auxiliary forces. The Fourth Geneva Convention explicitly prohibits any “pressure or propaganda which aims at securing voluntary enlistment,” and violation of the prohibition is a grave breach. It is further prohibited for an occupying power to seek to make a permanent change to the demographics of the occupied territory, for example for an occupying power to deport or forcibly transfer the civilian population of an occupied territory, in whole or in part, unless the security of the civilians involved or imperative military reasons demand it. Nor can the occupying power deport or transfer parts of their own civilian population into a territory they occupy. While Russia is entitled to offer citizenship to whoever qualifies under its national laws, irrespective of where they reside, a policy that seeks to coerce, directly or indirectly, a population in occupied territory to assume Russian citizenship is not permitted under international law. In addition to introducing policies that would discriminate against citizens of the occupied territory, in this case Ukrainians, Russian migration laws and policies may also lead to a situation where Ukrainian citizens in Crimea are forced out of Crimea. Any deportation or forced expulsions by Russia of Ukrainian citizens, individually or collectively, from Crimea would constitute a war crime. The process of bestowing Russian citizenship on Ukrainians in Crimea was not simply a matter of allowing those who wished to apply for Russian citizenship. The process required all residents of Crimea who were citizens of Ukraine prior to the occupation of Crimea to take proactive steps to confirm their Ukrainian citizenship within a one-month period, or become Russian citizens by default. While there are no official statistics available at time of writing on the number of people who were able to confirm their Ukrainian citizenship or those who obtained Russian citizenship, in a media interview in September a senior official of the Federal Migration Service (FMS) stated that by September, 98 percent of Crimean residents obtained Russian passports. There is no way to verify this data, but rights groups and numerous media reports suggest that a significant number of people who wished to retain their Ukrainian citizenship faced difficulties that prevented them from doing so within the one-month deadline. Such difficulties included the extraordinary short grace period compounded by lack of publicly available information on the procedure and other obstacles outlined below. According to Russia’s FMS, Crimea residents who wished to retain their Ukrainian citizenship did not automatically obtain Russian permanent residence status. They had to present Russian migration authorities with numerous documents, including proof of the fact that they permanently resided in Crimea as of March 2014. The FMS considers a residence registration as the main proof of one's place of residence. Indeed, this residence stamp in one’s passport is required of all permanent or temporary residents of Russia by law. In Ukraine, however, getting a residence stamp is mostly voluntary. As a result, many people, while in practice residing in Crimea, either did not have the registration stamp in their passport at all or were formally registered in mainland Ukraine. To get a Russian permanent residence permit, they had to demonstrate they were residing in Crimea permanently in March. Certain categories of residents of Crimea were left with no option but to accept Russian citizenship. This was particularly the case for prisoners, people with disabilities, or others who could not meet the in-person requirements to declare their Ukrainian citizenship by the April 2014 deadline. The Crimean Field Mission, a monitoring group based in Crimea, reported that some Crimean residents were threatened with dismissal at their workplace if they did not become Russian nationals. As noted above, under the March 2014 law Crimea residents who did not want Russian citizenship and declared their Ukrainian citizenship ahead of the April 2014 deadline have the right to receive a permanent residence permit to stay in Crimea. Foreigners and stateless persons who were temporary residents in Crimea as of March 18 have until January 1 to apply to Russian migration services to obtain a new, Russian temporary residence permits for Crimea. In July, the Russian government introduced a quota system for temporary residence permits for non-Russian citizens in Crimea. The quota system provides only 5,000 temporary residence permits for non-Russians in Crimea and 400 for Sevastopol. The quota system raised very serious concerns among Russian and Ukrainian migration experts that the quota was set far too low to reasonably accommodate all foreigners who were already in Crimea on residence permits, in addition to Ukrainian citizens who wanted to retain their citizenship but were not able to successfully apply for permanent residency for the reasons stated above. Human Rights Watch came across several reports, which it was not in the position to independently verify, of individuals who had declared their Ukrainian citizenship and applied for permanent residence permits being required to present proof of stable income, including written confirmation from their employer when applying. This implies that residency will not be automatically granted and that there is a possibility that Ukrainian citizens could be refused residency permits and ultimately deported or expelled. Human Rights Watch came across several reports of Crimean residents facing difficulties while traveling to other parts of Ukraine. While Ukraine does not allow dual citizenship, Ukrainian authorities made public pledges not to penalize Ukrainian citizens forced to obtain Russian citizenship in Crimea—as indeed they should, since they should be recognized as continuing their Ukrainian citizenship. Despite that, in the last six months there have been reports of Ukrainian border guards deliberately searching people for Russian passports and refusing permission to Ukrainian citizens who have received Russian passports to enter mainland Ukraine from Crimea. Human Rights Watch has been able to document three such cases. As noted above, Human Rights Watch applies the international law of occupation to Russian forces in Crimea. Under the 1949 Geneva Conventions, territory is considered “occupied” when it comes under the control or authority of foreign armed forces, whether partially or entirely, without the consent of the domestic government. This is a factual determination, and the reasons or motives that lead to the occupation or are the basis for continued occupation are irrelevant. Following the February 2014 ouster of Ukraine’s former president, Viktor Yanukovich, Russian armed personnel and pro-Russian militias in Crimea prevented Ukrainian armed forces from leaving their bases, took control over strategic facilities, and took over Crimea’s administrative borders with the rest of Ukraine. On March 16, Crimea’s local authorities held a referendum on whether Crimea should secede from Ukraine to join the Russian Federation. The Ukrainian government did not recognize and declared the referendum illegal. After local authorities announced on March 17 that 97 percent of the population had voted to join Russia, President Vladimir Putin of Russia signed a decree recognizing Crimea as an independent state. On March 18, Putin and Crimea’s leadership signed agreements making Crimea and the city of Sevastopol part of the Russian Federation. Russia’s parliament subsequently adopted a law accepting the new regions as parts of the Russian Federation. As a matter of international law Crimea is considered to be a part of Ukraine. The referendum vote and decisions on sovereignty by local authorities in Crimea took place during military occupation of Crimea by Russia and in face of objection by Ukraine and without any broad-based support of the international community. On March 27, the UN General Assembly adopted Resolution 68/262 on the “Territorial integrity of Ukraine,”  in which it underscored “that the referendum held in the Autonomous Republic of Crimea and the city of Sevastopol on 16 March 2014, having no validity, cannot form the basis for any alteration of the status of the Autonomous Republic of Crimea or of the city of Sevastopol.” Consequently, under international law neither the referendum nor its endorsement by Russia can be considered to effect a transfer of sovereignty that would end the state of belligerent occupation and do not impact the applicability of the law of occupation to the Crimea situation. Both Ukraine and Russia are parties to several international human rights treaties, including the International Covenant on Civil and Political Rights and the European Convention on Human Rights, which continue to be applicable during the occupation. While in a time of war restrictions on and derogations from many of these rights are permitted (e.g. restrictions on freedom of assembly and right to privacy), such restrictions are limited to those that are strictly required by the necessity of the situation and that are compatible with obligations under international humanitarian law. Several rights such as the prohibition on torture, inhuman and degrading treatment, and the obligation of nondiscrimination cannot be subject to restrictions. The UN Human Rights Committee and the European Court of Human Rights also retain jurisdiction over Crimea. Ukraine has already filed three cases against Russia for actions in Crimea with the European Court of Human Rights. The first application, Ukraine v. Russia I (no. 20958/14), lodged in March 2014, alleged that the civilian population on the territory of Ukraine was at risk of measures by Russia that might threaten their life and health. The second application, Ukraine v. Russia II (no. 43800/14), lodged in June, concerns the alleged transfer of 16 children and 2 teachers from Ukraine to Russia who have since been returned to Ukraine. And in the third application, Ukraine v. Russia III (no. 49537/14), lodged in July, a complaint was made on behalf of Hayser Dzhemilov regarding his detention in Simferopol. In all cases the court invoked rule 39 of the Rules of Court and indicated to the governments of Russia and Ukraine that they should ensure respect for convention rights of the civilian population and the particular persons involved. According to the European Court, by August 12, 2014, 55 individual applications were also lodged with the court against either or both Ukraine and Russia relating to events in Crimea or southeastern regions of Ukraine. This report was researched and written by Yulia Gorbunova, Ukraine and Belarus researcher with Human Rights Watch’s Europe and Central Asia division. The report was edited by Rachel Denber, deputy director of the Europe and Central Asia division of Human Rights Watch. It was reviewed by Aisling Reidy, senior legal advisor, Tom Porteous, deputy program director and Veronika Szente Goldston, advocacy director with the Europe and Central Asia division. Aisling Reidy also contributed to the report’s legal analysis. Andrew Bogrand, Alfa Fellow, Maryna Shcherbyna, former intern in the Berlin office of Human Rights Watch and Jonny Dzhibladze and Evgeny Belyakov, Natalia Estemirova Fellows in the Europe and Central Asia division, provided invaluable research assistance. Translation into Russian was provided by Igor Gerbich, freelance translator for the Europe and Central Asia division. Translation into Ukrainian was provided by Yuri Frank, freelance translator for the Europe and Central Asia division. Production assistance was provided by Kaitlin Martin, associate in the Europe and Central Asia division; Kathy Mills, publications specialist; and Fitzroy Hepkins, production manager. Jessie Graham, senior multimedia producer, and Jenny Catherall, multimedia coordinator, directed and produced the video component of the project. Human Rights Watch wishes to thank the victims, witnesses, and other individuals who came forward and offered testimony and other information for this report. Human Rights Watch also expresses its gratitude to the Crimea Field Mission, whose work in Crimea was indispensable to the preparation of this report and to Alexander Verkhovsky, director of the SOVA Center for Information and Analysis, for his important contribution. See Human Rights Watch news releases, “Crimea: Enforced Disappearances,” October 7, 2014, http://www.hrw.org/news/2014/10/07/crimea-enforced-disappearances; “Crimea: Attacks, ‘Disappearances’ by Illegal Forces,” March 14, 2014, http://www.hrw.org/news/2014/03/14/crimea-attacks-disappearances-illegal-forces; “Crimea: Disappeared Man Found Killed,” March 18, 2014, http://www.hrw.org/news/2014/03/18/crimea-disappeared-man-found-killed; “Ukraine: Activists Detained and Beaten, One Tortured,” March 25, 2014, http://www.hrw.org/news/2014/03/25/ukraine-activists-detained-and-beaten-one-tortured. Draft law of the Republic of Crimea, “On Preventing Persecution of Persons for Actions Directed at Upholding Public Order and Protecting Interests of the Republic of Crimea [О недопущении преследования лиц за действия, совершенныевцеляхохраныобщественногопорядкаизащитыинтересовРеспубликиКрым],” http://www.rada.crimea.ua/textdoc/ru/6/project/1664.pdf (accessed November 3, 2014). Draft of Federal Law “On Introducing Changes to the Federal Constitutional Law of March 21, 2014 No. 6-FKZ ‘On the Acceptance of the Republic of Crimea into the Russian Federation and the Creation of New Federal Subjects – the Republic of Crimea and the City of Sevastopol,’ [О внесении изменений в Федеральный конституционныйзаконот 21 марта 2014 года № 6-ФКЗ ‘ОпринятиивРоссийскуюФедерацию Республики Крым и образовании в составе Российской Федерации новых субъектов – Республики Крым и города федерального значения Севастополя’],” http://asozd2c.duma.gov.ru/addwork/scans.nsf/ID/16740DBDDF67CCDF43257D650048D45D/$FILE/613379-6.PDF?OpenElement (accessed November 2, 2014). Regulations concerning the Laws and Customs of War on Land, annexed to Hague Convention (II) of 1899 and Hague Convention (IV) of 1907, art. 43 and 46. See also Yoram Dinstein, The International Law of Belligerent Occupation (Cambridge: Cambridge University Press, 2009), p. 108. “Putin: decree on rehabilitation of Crimean Tatars is a basis for moving forward [Путин: указ о реабилитации крымских татар - основа для развития],” Ria Novosti, May 16, 2014, http://ria.ru/politics/20140516/1008042615.html (accessed October 28, 2014). On June 4, 2014, the parliament of Crimea adopted a decree providing for social guarantees to Crimean Tatars and other ethnic groups who were had been deported. Official census of the population by the State Statistics Service of Ukraine, http://2001.ukrcensus.gov.ua/rus/results/general/nationality/crimea/ (accessed November 4, 2014). See Human Rights Watch news releases, “Crimea: Enforced Disappearances,” October 7, 2014, http://www.hrw.org/news/2014/10/07/crimea-enforced-disappearances; “Crimea: Attacks, ‘Disappearances’ by Illegal Forces,” March 14, 2014, http://www.hrw.org/news/2014/03/14/crimea-attacks-disappearances-illegal-forces; “Crimea: Disappeared Man Found Killed,” March 18, 2014, http://www.hrw.org/news/2014/03/18/crimea-disappeared-man-found-killed. Dzhemilev learned of the designation when he was crossing the administrative border between Crimea and mainland Ukraine, and local authorities handed him a document stating he was banned from returning to Crimea. “Prosecutor of Crimea saw ‘mass riots’ during the gathering of Crimean Tatars to meet Dzhemilev at the border [Прокурор Крыма разглядела ‘массовые беспорядки’ во встрече татар и Джемилева на границе],” Rosbalt, May 4, 2014, http://www.rosbalt.ru/federal/2014/05/04/1264281.html (accessed October 7, 2014). Human Rights Watch telephone interview with Refat Chubarov, May 21, 2014. “Crimea: Mejlis activities considered extremist [Крым: деятельностьмеджлисасочлиэкстремизмом],” SOVA Center, http://www.sova-center.ru/misuse/news/persecution/2014/07/d29884/ (accessed November 2, 2014). “Akseyonov announced that the Mejlis doesn’t exist [Аксеновзаявил, чтомеджлисанесуществует],” ATN, http://atn.ua/politika/aksenov-zayavil-chto-medzhlisa-ne-sushchestvuet (accessed October 14, 2014). Human Rights Watch interview with Eskender Bariev, October 6, 2014. Human Rights Watch interview with Zair Smerdlyaev, October 24, 2014. Human Rights Watch interview with Emil Kurbedinov, October 24, 2014. Human Rights Watch interview with Riza Shevkiev, October 13, 2014. Human Rights Watch interview with Radio Free Europe journalist N., October 1, 2014. “Mass searches in the homes of Crimean Tatars last night – Mejlis[Сегодняночьюсостоялисьмассовыеобыскивдомахкрымскихтатар, – Меджлис],” Censor.net, May 15, 2014, http://censor.net.ua/news/285457/segodnya_nochyu_sostoyalis_massovye_obyski_v_domah_krymskih_tatar_medjlis (accessed October 15, 2014). “Brief overview of the human rights situation in Crimea [КраткийобзорситуациисправамичеловекавКрыму],” Crimea Field Mission, September 2014, http://crimeahr.org/sites/default/files/obzor_krymskoy_polevoy_missii_sentyabr_2014.pdf (accessed October 21, 2014). Human Rights Watch interview with Mustafa Asaba, October 2, 2014. Human Rights Watch interview with Asadullah Bairov, October 27, 2014. “In the occupied Yalta, armed people conducted a seven-hour search in a mosque [ВоккупированнойЯлтевооруженныелюдисемьчасовпроводилиобысквмечети],” Black Sea News, September 24, 2014, http://www.blackseanews.net/read/87800, (accessed October 15, 2014). Human Rights Watch telephone interview with Alexander Verkhovsky, November 7, 2014. “Aksyonov gave Crimean residents three months to give up prohibited literature [АксеновдалжителямКрыматримесяцанасдачузапрещеннойлитературы],” Openrussia.org, http://openrussia.org/post/view/427/ (accessed November 3, 2014). Human Rights Watch telephone interview with Elizaveta Bohutska, October 3, 2014.
http://www.rada.crimea.ua/news/11_06_2014_1 (accessed October 4, 2014). Human Rights Watch news release, “Crimea: Disappeared Man Found Killed,” March 18, 2014, http://www.hrw.org/news/2014/03/18/crimea-disappeared-man-found-killed. Human Rights Watch news release, “Ukraine: Activists Detained and Beaten, One Tortured,” March 25, 2014, http://www.hrw.org/news/2014/03/25/ukraine-activists-detained-and-beaten-one-tortured. Human Rights Watch Skype interview with Andriy Shekun, October 16, 2014. Human Rights Watch interview with Adburaman Egiz, October 2, 2014. Osman Pashaev’s video interview, Crimea Open Channel, May 18, 2014, http://www.youtube.com/watch?v=89oE8UTAX2o (accessed November 2, 2014). Human Rights Watch interview with Lilya Budzhurova, October 3, 2014. “Media freedom under siege in Crimea, Ukraine, says OSCE representative,” OSCE news release, March 8, 2014, http://www.osce.org/fom/116240 (accessed November 2, 2014). Human Rights Watch interview with Sergey M., October 4, 2014. Human Rights Watch interview with Shevket Kaibullaev, October 1, 2014. “Commentary of the Information and Press Department of the Russian Ministry of Foreign Affairs in in response to the statement by the OSCE expressing concern about the fate of Avdet [Комментарий Департамента информации и печати МИД России в связи с заявлением Представителя ОБСЕ по вопросам свободы СМИ Д.Миятович о ситуации вокруг газеты ‘Авдет’],” Ministry of Foreign Affairs of the Russian Federation, September 22, 2014, http://www.mid.ru/brp_4.nsf/newsline/2521FB260EFAFE9744257D5B0051A5D2 (accessed November 5, 2014). Federal law no. 6- FKZ from March 21, 2014, Rossiiskaya Gazeta, http://www.rg.ru/2014/03/22/krym-dok.html (accessed November 6, 2014). See also, “Information for foreign citizens and stateless persons residing on the territory of the Crimean peninsula and the city of Sevastopol [Информация для иностранных граждан и лиц без гражданства, проживающих (пребывающих) на территории Республики Крым и г. Севастополя],” Federal Migration Service of the Russian Federation, http://www.fms.gov.ru/treatment/voprosy/info_dlya_instrn_grzhdn_v_krymu/ (accessed November 1, 2014). Regulations concerning the Laws and Customs of War on Land, annexed to Hague Convention (II) of 1899 and Hague Convention (IV) of 1907, article 45. See also Yoram Dinstein, The International Law of Belligerent Occupation (Cambridge: Cambridge University Press, 2009), para. 124. Geneva Convention (IV) relative to the Protection of Civilian Persons in Time of War, August 12, 1949, art. 8. Geneva Convention (IV), arts. 51 and 147. Geneva Convention (IV), art. 49. For excellent summaries regarding citizenship in Crimea, see reports by the UN Human Rights Monitoring Mission in Ukraine; see especially the report of May 15, 2014: http://www.ohchr.org/Documents/Countries/UA/HRMMUReport15May2014.pdf (accessed November 14, 2014) and of June 15, 2014: http://www.ohchr.org/Documents/Countries/UA/HRMMUReport15June2014.pdf (accessed November 14, 2014). “FMS: 98% of Crimean residents obtained Russian passports [98% жителейКрымаполучилироссийскиепаспорта],” BBC Russian Service, September 11, 2014, http://www.bbc.co.uk/russian/rolling_news/2014/09/140911_rn_crimea_russian_passports (accessed November 10, 2014). “Russian or Else: On How Russia is foisting its citizenship in Crimea,” Kharkiv Human Rights Group, September 22, 2014, http://khpg.org.ua/en/index.php?id=1411211863 (accessed November 5, 2014). Brief overview of the human rights situation in Crimea [КраткийобзорситуациисправамичеловекавКрыму],” Crimea Field Mission, July-August 2014, http://crimeahr.org/sites/default/files/otchet_krymskoy_polevoy_missii_-_iyul-avgust_2014.pdf (accessed November 1, 2014). “Crimeans refuse Russian citizenship [Крымчанеотказываютсяотроссийскогогражданства],” Krym Realii, April 4, 2014, http://ru.krymr.com/content/article/25321899.html (accessed November 11, 2014). On April 11, Russia’s Federal Migration Service in Crimea officially confirmed on its Facebook page that Crimea residents with Ukrainian citizenship could declare their wish to retain Ukrainian citizenship at Russia’s consulates and embassies worldwide. However, the same statement also acknowledged problems with applications possibly not arriving to the FMS due to postal services’ glitches and encouraged people to apply in person in Crimea. “Crimean citizen had to return from Germany to retain Ukrainian citizenship [КрымчанканамеренновернуласьизГерманиичтобысохранитьукраинскоегражданство],” Fakti, April 8, 2014, http://fakty.ictv.ua/ru/index/read-news/id/1511057 (accessed October 15, 2014). See also, “Entry – oneruble, exit – two. To retain Ukrainian citizenship in Crimea is much more difficult than to obtain Russian [Вход – одинрубль, выход – два. Сохранить украинское гражданство в Крыму намного сложнее, чем получить российское], ”Radio Liberty, October 10, 2014, http://www.svoboda.org/content/article/25319928.html (accessed November 6, 2014). “Information for foreign citizens and stateless persons residing on the territory of the Crimean peninsula and the city of Sevastopol [Информация для иностранных граждан и лиц без гражданства, проживающих (пребывающих) на территории Республики Крым и г. Севастополя],” Federal Migration Service of the Russian Federation, http://www.fms.gov.ru/treatment/voprosy/info_dlya_instrn_grzhdn_v_krymu/ (accessed November 1, 2014). Svetlana Gannushkina, “ЗаметкиоКрыме[Notes on Crimea],” Novaya Gazeta, April 24. 2014, http://www.novayagazeta.ru/comments/63343.html (accessed November 12, 2014). “On the establishment of quotas for issuing temporary residence permits to foreign citizens and stateless persons in the Russian Federation (as amended July 19, 2014) [Об установлении квоты на выдачу иностранным гражданам и лицам без гражданства разрешений на временное проживание в Российской Федерации (с изменениями на 19 июля 2014 года)],” http://docs.cntd.ru/document/499062521 (accessed November 12, 2014). “Crimean FMS department explained that more than 5000 foreign citizens can reside in Crimea [В крымском управлении ФМС разъяснили, что на полуострове могут длительно проживать гораздо больше 5 тыс иностранных граждан],” Krym Inform, September 23, 2014. http://www.c-inform.info/news/id/12604 (accessed November 2, 2014). Human Rights Watch interview with Nadjie F., October 1, 2014. Human Rights Watch Q&A, “Questions and Answers: Russia, Ukraine and International Humanitarian and Human Rights Law, March 22, 2014, http://www.hrw.org/news/2014/03/21/questions-and-answers-russia-ukraine-and-international-humanitarian-and-human-righ-0. See Geneva Conventions, common art. 3; Fourth Geneva Convention, art. 13; Additional Protocol I, art. 75(1).